It’s the world series for runners and the oldest organized marathon in the history of the world. It, like the Hawiian Ironman is to triathlon, is the measuring stick every non runner will forever measure you by. This year with the birth of my second child, I decided (wisely as my wife might add) to scale back the triathlon training and just do a little running (and swimming when I get the itch) and train for a marathon. So if one were to train for a marathon, what better marathon to set your sights on than Boston. Boston is a race, like very few other marathons around the world, that you must qualify for in order to run. There are other ways in, like being a member of some secret runner society for umpteen years and get a waiver or be a major corporate sponsor. But for most of the world, you need to have run a marathon within the time standards that the Boston Athletic Association has set forth in order to toe the line. If you are so capable then you have 18 months to use the time or its back to qualifying again. The course itself is not especially epic in nature. It’s got some hills to make it interesting along the way, with one famous hill towards the end affectionately known as “Heartbreak Hill”. Heartbreak Hill is positioned late into the race, compounding your problems as fatigue sets in. So while the course has some challenges, that’s not what makes this race so special. The draws of Boston are the crowds and the tradition. The noise levels along the course from all the spectators are legendary. And they don’t just yell for the leaders. Here, all the runners get to experience the noise. And who doesn’t want run the same course that some of the most epic battles took place. 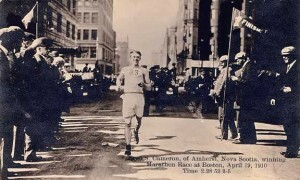 The race is steeped in a great marathon history. Perhaps the greatest story of the Boston Marathon has more to do with one of the great scams of all time than it does with it’s great champions. 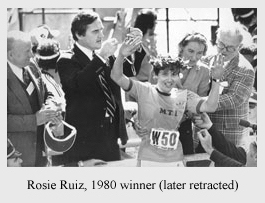 Afterall who hasn’t heard story of Rosie Ruiz, the women’s winner in 1980. Winner that is, until it was discovered that she started the race, took the subway up to the finish, poured a drink on herself to look like she was sweating and jumped onto the course to win it all. With witnesses everywhere, this was a plan that wasn’t very well thought out, but it sure adds to the fun and history of this race. As an edurance athlete, I knew long ago that I needed to experience this race at least once in my life. On April 20, 2009, I’ll be getting my chance.